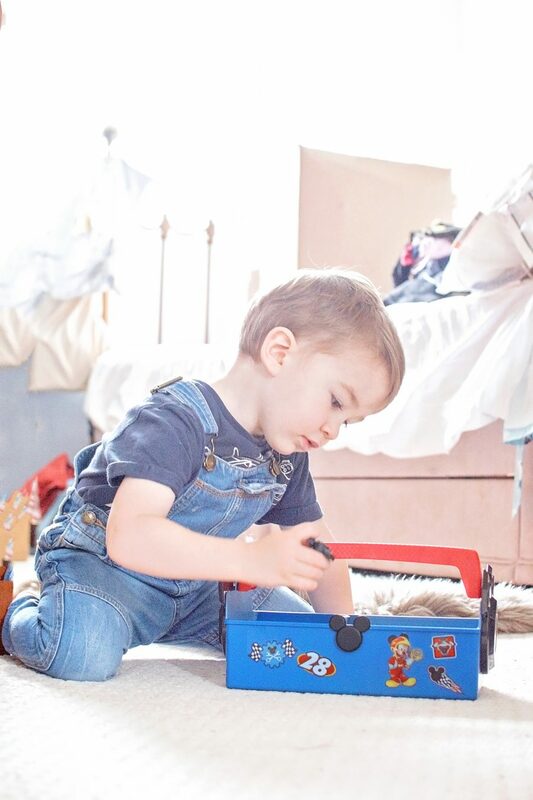 This week, Hero has been trying out a toy for little mechanics – Disney Junior’s Mickey and the Roadster Racers‘ Pit Crew Toolbox. We’ve watched the series daily since it first aired and we absolutely love it. Before it burst onto our screens, we were Mickey Mouse Clubhouse fans but now Hero and I enjoy a cup of tea and biscuits in the morning whilst we watch them zooming about the globe on adventures. This morning there is literally no light in our house. Winter has stolen it all and so we have the noisiest photos going I’m afraid – and whilst my bedroom does look like the packing department of the North Pole Reindeer Station, I did feel like I’m doing my bit and showing that our house is not picture perfect. Haha. Far from it. Schooltime is when I can rearrange all of the bits and pieces that I need to keep secret, and I also have about 200 bits of laundry to put away. 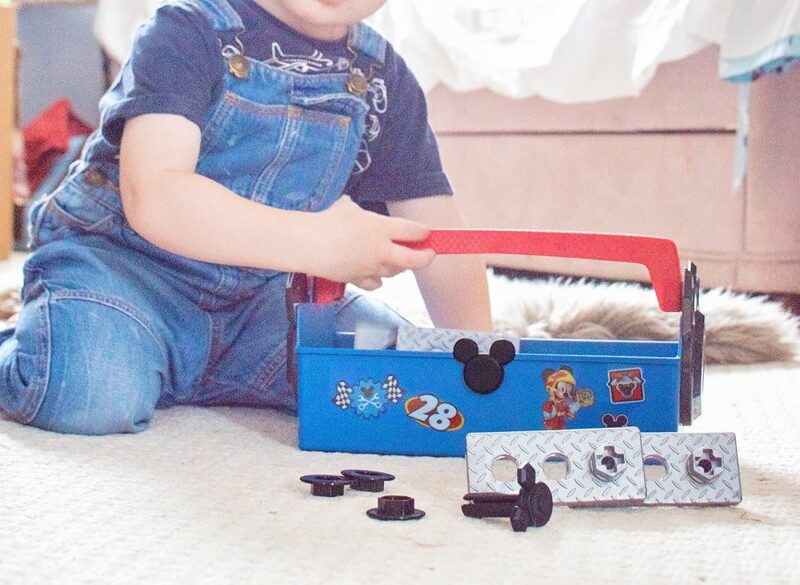 The Disney Junior Mickey and the Roadster Racers Pit Crew Toolbox is suitable for little Mouseketeers aged 3 and up – and inside the little toolbox are 23 fun tools – a hammer, flat head screwdriver, 2 wrenches, play metal plates, screws, nuts, and Mickey head shaped nails [our favourite]. If you buy this, please don’t make the same mistake I did and READ the instructions – it is possible to take the handle off to allow for the parts to come out which are encased in plastic. I got quite the workout trying to wrench the plastic from the set to free the tools – and then felt really silly when I saw on the label how to unclip the toolbox. I hadn’t wanted to try that in case I broke the handle, but as it turns out, I was supposed to. Lesson learned. …that this is a MICKEY MOUSE toy. 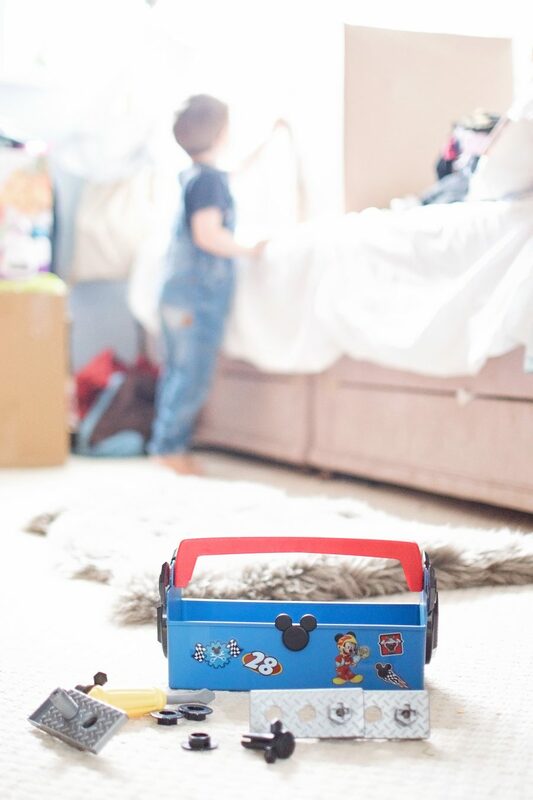 I – I mean, the boys – get really excited when something Disney crosses the threshold into our house – and when it’s Mickey himself, that’s the toy jackpot. …batteries are not required! Imagination is all you need to start playing with this kit. …No assembly! Hallelujah! Something I did not have to clip or read instructions for with an impatient boy at my side. …the Mickey head nails. When it’s Mickey shaped, it really feels like Disney – stickers alone don’t make something a Mickey Mouse product for us, and this really is the Disney Junior Mickey and the Roadster Racers Pit Crew Toolbox. …the peg board side to the toolbox – that was a lot of fun for Hero, singing Hot Dog to himself as he banged and screwed the little nuts and bolts and nails in. …that there is enough room in the toolbox for extra bits and pieces to fit. 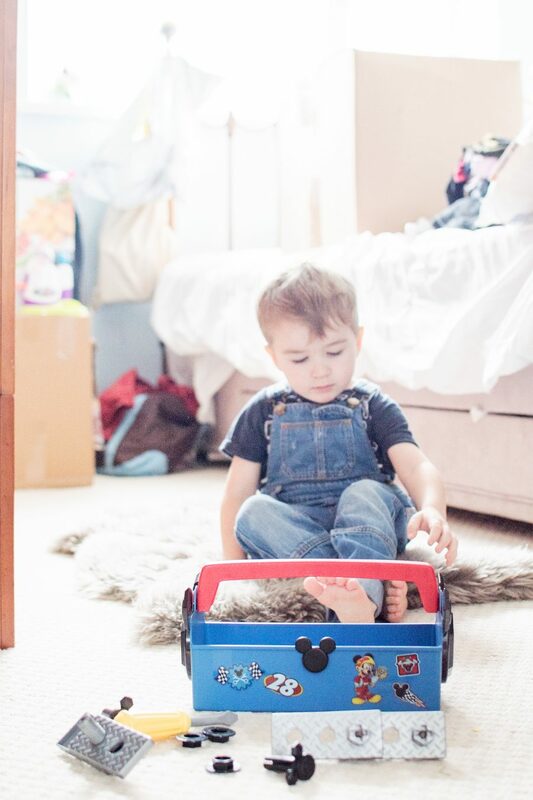 …the price – £15 for a role play toy is great value – and now Hero can pretend he’s Mickey any time he likes and fix various cars about the house instead of just playing with the little figures. It’s always more fun to get into character! …that the little plates allowed a peg to fit in every hole when lined against the pegboard. Hero got frustrated when he could see a hole he couldn’t pop a Mickey nail into and didn’t understand that the plates were a little too big. …that there were more toys like the Disney Junior Mickey and the Roadster Racers Pit Crew Toolbox from Disney – dare I say it – more for boys, and for role playing.